Summer is the perfect time to use water games to support your child’s sensory diet. Most water games primarily provide proprioceptive input, which is often calming and organizing in nature. Activities that involve lifting, pushing, pulling, dragging, squeezing or crashing all provide proprioceptive input. However, if your child has tactile sensitivities, they may find small water droplets to be alarming, uncomfortable or even unbearable. Let your child explore water games on their own terms and be flexible with the rules and expectations. 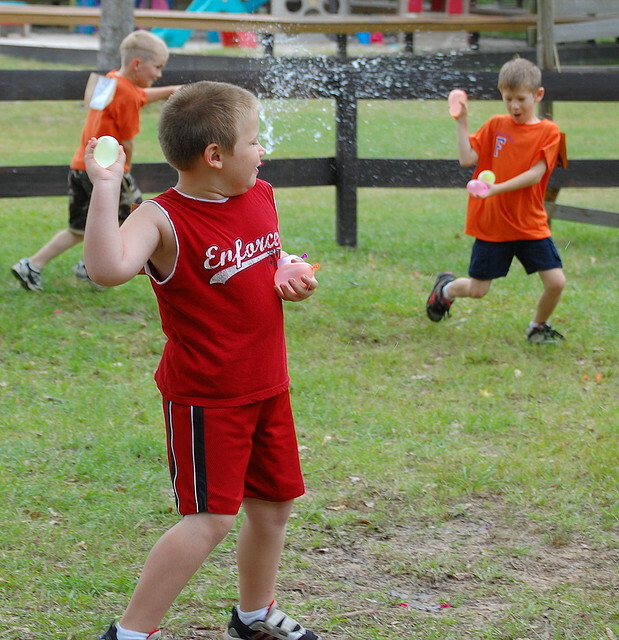 Play catch with water balloons. After each catch, have each person take a step backwards. Make a water obstacle course. Set up obstacles for your child to go over, under, around, etc., but increase the challenge (and fun) by having him carry a cup of water through the course to dump into a bucket on the other side. Continue until the bucket is full. Car washing sponges are a great way to add some weight to a scavenger hunt. 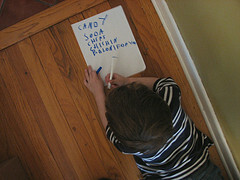 Have your child fill a sponge with water and hunt for objects you have hidden in the back yard. When she finds an object, she should “tag” it by squeezing out the sponge and soaking the object, then head back to fill the sponge again. Print out pictures of monsters, cartoon villains, or another character your child is interested in. Hang them from trees or a fence (try weighting them down by taping a clothespin to the back so they don’t blow too much in the breeze). Have your child use a water blaster to take aim and soak all of the “bad guys”. The tube-shaped water blasters that squirt water out by pushing a handle are great for this.